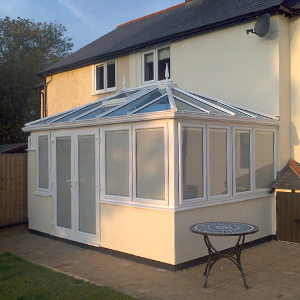 A sun room has the look of an orangery inside but is a conventional conservatory on the outside. This is a great way to inexpensively add a whole other room to your property that blends in seamlessly with your home and allows a natural transition from indoors to outdoors. We have a range of different styles and designs and can of course build your sun lounge in a colour that matches and suits your property. A sun lounge conservatory is the perfect place to entertain guests and relax in the morning with a nice coffee while enjoying the natural beauty of your garden. When you want to find out more about our sun lounges please call 01279 813888 and have a chat with our team, we are able to answer all your questions and can arrange a time to visit your property and arrange a full, detailed quote.